The 2017 Bayreuther Festspiele broadcasts may be over, but I am still stuck up here on this comely Green Hill. Accordingly, the principal cast members for the week’s Aida are all Wagnerians: Birgit Nilsson, Sándor Kónya, Rita Gorr, and Cornell MacNeil, led by Silvio Varviso in 1964. Cornell MacNeill, remembered mostly as a Verdi baritone and Scarpia, is the only one of this group who never sang at Bayreuth, but Wagner’s Holländer was in his repertoire: of what I could easily find, he sang two Met performances with Leonie Rysanek in 1968 (one of which was broadcast), and four at Wiener Staatsoper in 1972. 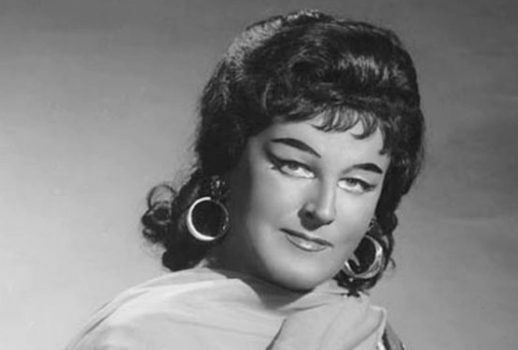 Birgit Nilsson had the longest association with Bayreuth singing there almost every season from 1953 through 1970 as Ortlinde, Elsa, Sieglinde, Isolde, and Brünnhilde. She frequently received accolades as great as those awarded for her Isolde for her dips into the Italian repertoire, which included Donna Anna, Aida, Amelia in Un ballo in maschera, Tosca, and, of course, Turandot. The incredibly versatile Sándor Kónya was my first Edgardo in Lucia di Lammermoor. Throughout his lengthy career, he maintained an elegant balance ranging from bel canto to dramatic roles. I also recall his Rodolfo at Dorothy Kirsten’s Met 25th anniversary La bohème. His association with Bayreuth spanned 1958 through 1971 as Froh, Lohengrin (one of his signature roles), Walther von Stölzing, Parsifal, and two unscheduled performances as the Junger Seemann in Tristan und Isolde when he filled in for an ailing colleague. Rita Gorr performed at Bayreuth only in 1958 and 1959, but she managed to sing Fricka, Ortrud, the Third Norn, and Grimgerde. Silvio Varviso was a Bayreuth podium regular between 1969 and 1974, during which time he led performances of Der fliegende Holländer, Lohengrin, and Die Meistersinger von Nürmberg. John Macurdy, heard here early in his career as the King, later made a name for himself in the great Wagner bass roles at the Met.